Welcome to the Boston Facilitators Roundtable! The BFR is a professional development network of 800+ facilitators, trainers, coaches and organizational development (OD) professionals, from across New England. In Feb. 2015, the BFR became the New England regional chapter of the OD Network. Our mission is to provide professional development in organizational development, facilitation and coaching to professionals who work to increase the impact and effectiveness of leaders, teams and organizations. We also enjoy the colleague-ship of members who share their knowledge and expertise for the learning benefit of the entire community. 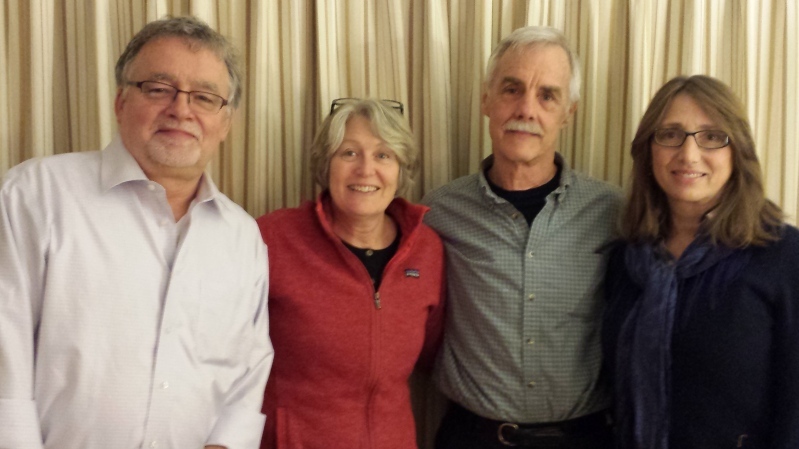 The BFR, which has been meeting in Boston since 2000, serves members from throughout New England. Throughout the year BFR members get together for 8 face-to-face workshops; see the upcoming programs on the home page and the description of past programs. Member Benefits: In addition to meeting discounts, BFR members also post messages to the BFR Forum and receive job postings, and have access to a file archive of member advice and a member directory. BFR members also receive a $25 discount on OD Network membership. Join Us! We look forward to meeting you. 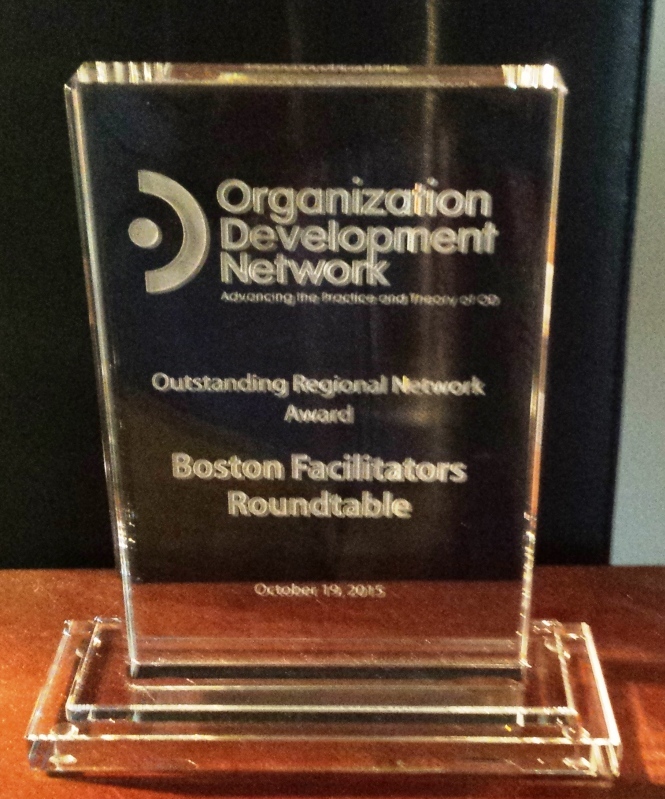 In March 2015, the Boston Facilitators Roundtable received the "Outstanding Regional Network Award" from the national OD Network! "This Award honors a Regional Network whose leadership, programs, organization and mission; respond to its members’ needs, and adds value to a diverse constituency of local practitioners." The unique value of the BFR is the collegial and welcoming community that we have built. We thrive on fun, interactive workshops and an active member communication forum. The BFR has an embarrassment of riches in our skilled members who share generously of their knowledge and expertise. Since 2001 we have grown from a small group of about 200 people to a dynamic network of 800+ people. We are committed to inclusion and to delivering high value. Come see for yourself! them for their board service! 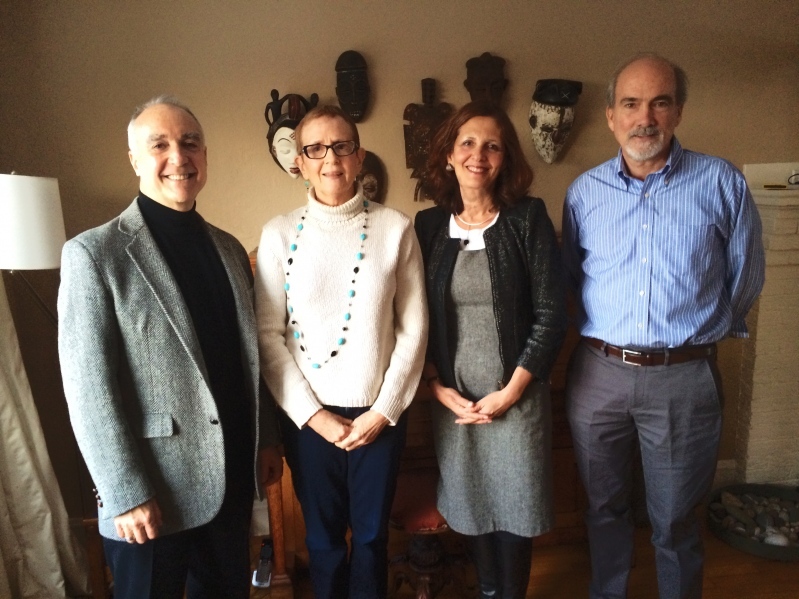 At left is the the 2013 Board of Directors: Perry Carrison, Martha Mueller Cook, Fredia Woolf, and Peter McLoughlin. Many thanks to Perry, Fredia, Martha and Peter who stepped down in 2014-2015 after many years of staunch support of the BFR. This is one of the BFR's most popular programs, in which we get to sharpen our coaching and consulting skills. Seven-eight (7-8) executive directors will bring us their organizational problems, and in small groups we will collectively coach each director to help them get clear about, and address, their current problem. How do we know something when we don’t know it? Growing our capacity to notice from within—embodied self-awareness—is a central skill in expanding our coaching and facilitation practice. Come explore with us. The BFR has a No-Marketing policy, which helps preserve the collegial culture we've built. Members ask we not market our OD/ Facilitation/ Coaching services to one another. 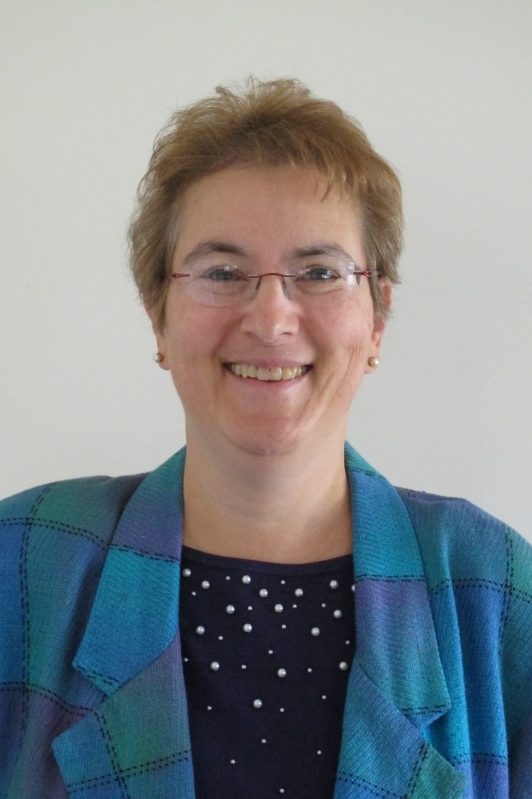 Members may, however, promote their programs in the BFR monthly calendar, for which Sharon Kalus solicits submissions every month by email. Thank you Sharon!